Landscape LED low voltage lighting is a great way to make your yard really stand out. You don’t want to have big electric bills, though, and there are ways to get the lighting you love without a lot of expense. One of the best ways to do that is through the use of low voltage lighting, which doesn’t use a lot of electricity but easily lights up even the biggest yards when placed correctly. There are also excellent options for eco-friendly lighting, so you can get everything you want in your outdoor lighting without harming your plants or the rest of the surrounding environment. Taking care of your yard is important while you work to make it look as good as possible, day or night. Many people choose low voltage outdoor LED lighting so they can add beauty to their yard for the right price, and so they can add a larger number of lights without a lot of expense or heat. Low voltage lighting is cool and comfortable to the touch, so these lights can be placed close to plants without causing any damage or putting delicate plants and flowers at risk. These kinds of lights are a great option for gardeners who want to show off their lovely flowers during the nighttime hours as well as when it’s daylight. They also last a very long time, so you won’t be spending your evenings changing light bulbs and can enjoy all the quiet beauty that your yard has to offer. 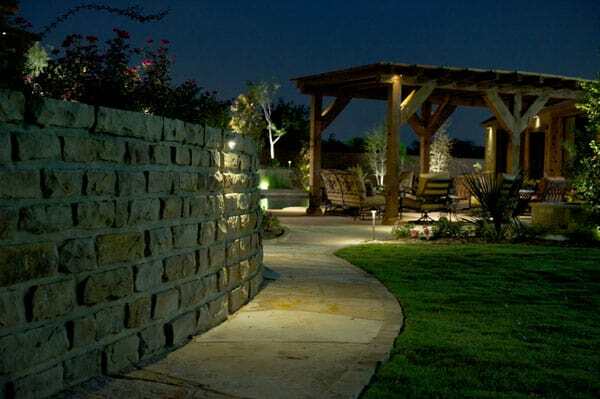 Contact Creative Nightscapes and let us help you get started on making your yard a lovely nighttime retreat with outdoor lighting for your home’s exterior and landscaping. Carrollton, TX is a wonderful place to live. There is so much to do, that you’ll never be bored or run out of things for fun and adventure. 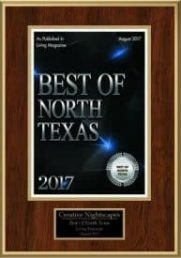 Historic downtown Carrollton offers browsing and shopping opportunities to enjoy day or night, so you can buy some great new things for your house and yard or get new clothes or something to eat. If you like spas and salons, you’ll also enjoy Carrollton. With several spa options in the area, you can get a massage, a facial, or other pampering so you can look and feel your best. Golf is a popular choice in Carrollton, and there are candy and soda shops as well as historic sites like the A.W. Perry Homestead. Sandy Lake Amusement Park is there, too, so you can take your kids for a day out in the sunshine. You can even go rock climbing or take a chocolate-making class. The great options and its proximity to Dallas make Carrollton an excellent place to live, work, and play, whether you’re a retiree, part of a family with kids or a single person just getting started out in life. Buying a house in Carrollton gives you access to all the wonderful things to do in the area, along with a great yard you can have landscaped and lit to make it really feel like your own.